Creative and unique storytelling techniques will keep your audience on the edge of their seats waiting to see what happens next. Imagine your family history becoming a multimedia display: photographs organized, restored and properly ordered to keep on display; films restored, reorganized and transferred for easy viewing onto CD, computer or digital frames. Those old mementos from a forgotten time can be brought out of the dark and imaginatively incorporated with your photographic storybooks or displayed in some other fashion. Every family is different, of course, and each family has a unique and varied story to tell. Just because certain items do not seem to go together, does not mean that they shouldn’t. For example, a reinvented family history album can include both antique and new photographs of your present family. New insights can be made when viewing these pictures side by side. Who knew, for instance, that your daughter resembled great-great Aunt Esther to a tee? Or old film reels from the early part of the twentieth century can be incorporated into a present day digital video of your family. Imagine the comparisons that can be made. What a rare and one-of-a-kind way to keep your family history on view for everyone! Perhaps music was a part of your family’s history. An entire video family biography or history can be designed in a personalized way to reflect who your ancestors really were: music, animation, unique titles, narration, new and old photographs, film, important papers can all be put together in order to create a specialized family biography. If you’ve ever viewed a biography on the cable channel, A&E, you’ll get the idea of what a family video biography can be like. As the narrator speaks, the viewer is looking at old film footage, static photos of days long gone by, some present-day interviews, perhaps newspaper headlines or short articles are shown, and there is music weaving itself throughout the entire production. This is what your family history video can be like if it is professionally produced by our studios. The Storytelling techniques we use are unique to LS3Studios.com. 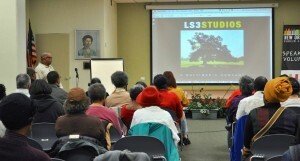 While creating video histories for people from all walks of life, LS3Studios has discovered that each family has a unique story to tell, many of which are quite emotionally touching. When performing a video interview with a member of your family, the family member will be in a comfortable and familiar setting where he or she can relax and tell his or her story with no nervousness about being in front of a camera. When all of the elements are put together to form a touching film for the family to own, it can sometimes be so close to the heart, tears are often brought to the surface. These can be tears of joy at seeing loved ones tell their stories or upon viewing those on film who have gone to the other side. Either way, each family who has a video biography put together by LS3Studios is thrilled to have a piece of the past now with them.